With the patented Tandem Air System, the Premium Synergy cleans circles around the competition. Wanna find that dirt? Twin ultra-bright LED headlights light up every dark corner, plus a Heads Up™ dirt sensor display shines on the cleaning path to let you know when the Premium Synergy has found deep down dirt and is pulling it out of your carpet. Want cleaning performance? You got it. Two motors work in tandem to lift more dirt and allergens than ever before from your carpets and floors and then whisk it away. Dust is trapped in Synergy’s 100% sealed system and 7 layers of filtration including a self-sealing HEPA media bag, HEPA media filter and a granulated charcoal filter. Looking for low maintenance? How about a belt that never has to be replaced and metal where it matters, in high-wear areas like the bottom plate, brushroll, handle tube and wand. Want convenience? A switch on the handle helps you go from carpet cleaning to bare floor cleaning. 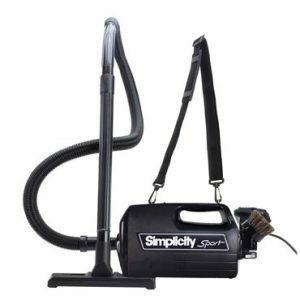 A 40-foot cord, on-board deluxe tools, a telescopic wand and a whopping 17-foot cleaning reach help you clean high and low without having to stop again and again to move to a different outlet or sacrifice cleaning ability or performance. Now more than ever before, Synergy is more than a vacuum cleaner. It’s a vacuum cleanest.